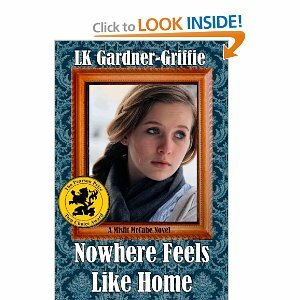 LK Gardner-Griffie started writing her first, never to be published, novel at the ripe old age of 9. She believes in that magic nation of imagination, and in everything sees the story lurking beneath the surface. Born in Seattle, WA and raised & living in southern California, LK is definitely a west coast g…irl, but loves to travel. The love of writing and travel were fostered very young by reading Louisa May Alcott’s Little Women and deciding that she and Jo had a great deal in common. While she didn’t have 3 sisters, and a father absentee in the war, the making up of stories, dramatic feelings, and a quick temper were enough for LK to know that she and Jo would have been kindred spirits. Outside the world of writing, LK loves listening to music and even more, singing. Country music is her favored genre (mostly because that’s what she sings). She and her husband Denny are strong supporters of Cal State Fullerton Baseball (Go Titans!) and they thoroughly enjoy supporting their nieces and nephews in their sport and music related endeavors.